Los Angeles is a city where good and evil mingle in every golden sunset and beautiful moments seem to shine more brightly as they break through the toxic haze. This setting inspired the songs on La Luz’s third album, Floating Features, written after Shana Cleveland, Marian Li Pino, Alice Sandahl, and Lena Simon moved to L.A. from Seattle. Singer/guitarist Cleveland started having intense dreams—even nightmares where dark figures came out of the wall and pinned her to the bed. As the city seemed to take over her subconscious, the stuff of dreams became a focal point for the lyrics she brought to the band. Floating Features is out now on Hardly Art and La Luz will return to L.A. with a show at the Teragram on Fri., June 22. This interview by Daiana Feuer. Dreams are ever-present on this album. Talk to me about dreaming. Shana Cleveland (vocals/guitar): When I was working on this album I always kept a notebook by my bed. I was having all these crazy dreams. ‘Walking Into The Sun’ was halfway written in my dream. It was playing in my dream and I was like, ‘Oh, that sounds nice,’ so I woke up and sang the exact words I heard in my dream and the melody, and later picked up a guitar and tried to figure it out. Then I started to realize that this narrative of dreams was taking over the songs I was writing and I tried to hone in on that and explore it. We spend half our lives dreaming. It’s a potent part of existence, and sometimes the line between dreams and reality is so tenuous. Shana Cleveland: And they can both be present. I’ve had so many dreams where I wake up and I’m disturbed for the rest of the day. I sort of still think that the things that happened while I was asleep are real, even though I’m telling myself they’re not. The feeling is still there so they are sort of real on a subconscious level. Were you having a lot of nightmares? Shana Cleveland: Yeah. ‘The Creature’ is the most realistic song in the sense that it tells exactly what happened to me when I was half asleep, so it’s surreal at the same time. It was a sleep paralysis experience, which is this crazy phenomenon that a lot of people have experienced where a dark figure walks out of the wall and looms on top of you and you can’t move. ‘The Creature’ is a direct retelling of when I had that experience. Shana Cleveland: Very. Then there’s ‘Lonely Dozer,’ which is about a dream that was not positive or negative but is sort of confusing and feels enlightening. I didn’t try to make much sense of it. I just tried to follow it—put it to music as best I could. I noticed that the last line of the whole album is ‘I don’t wanna die.’ Was that deliberate? Shana Cleveland: Wow—that’s funny. I didn’t really realize that. It must have been a subconscious thing. I guess I was thinking about this other song that we play at almost every show and the chorus is ‘Now I kinda wanna die,’ and so this is a nicer thing to sing. Shana Cleveland: It’s about not caring about making money. I’ve never really cared about money. I just want enough to not have to struggle. I’ve been touring for the past decade almost. I’m always running and trying to have this life where I’m free to do whatever I want. But the greed machine is always at your back. Because we don’t have universal healthcare in the U.S., what if something happens to me on the road? Then I’m just screwed and I’m not free anymore and I lose everything I’ve worked so hard for? I wrote this when it looked like Trump was going to be elected and I was stressing out about what that might mean for me and my ‘free-wheeling’ artist lifestyle. Shana Cleveland: In some ways that question reminds me of a lot of times people ask me, ‘What’s it like to be a woman in music?’ And I’m like, ‘I don’t know, I’ve never been a man in music.’ I never have thought about doing anything else than what I do. I’ve always wanted to be as free as possible, to move around a lot, to never settle down, and be free. I worked a really horrible job before I was able to just play music. Part of the reason for it was that I never wanted to get a job that would feel too comfortable. Instead I wanted to get a horrible job that I would hate so I would have to find a better way. I’m lucky it worked out otherwise I’d still be working at Cost Plus Market. There’s nothing wrong with that, but I would not be happy. Shana Cleveland: I feel lucky and very happy. It’s not like I think the world is in a good place, and I get pissed off at a lot of stuff but for me, personally, I’m doing what I want. I love playing music. All of us feel that way. You have to be insanely passionate to do this. You’re not hirable between tours. It’s hard to keep a relationship going. It’s even hard to keep friendships going when you’re on tour. This has to be what you love above everything else, and for us it is. So if ‘home is where the heart is,’ do you have a mobile home in your heart? Do you feel home anywhere in particular? Shana Cleveland: I feel really at home in California. I always wanted to live in California, even growing up in the Midwest. Even when we were living in Seattle before we all moved here, whenever we played here it felt right. It felt like the place that understood us. We all feel at home here. But I also feel that I’ll always have to travel around. I need both those things. You’ve got a bit of wanderlust. Shana Cleveland: I do. Everyone who tours a lot gets post-tour depression. No matter how amazing the place you come home to is, you just get intense blues when you’re stationary for a while. It gets addictive. It’s not even always fun. But I think it’s because you’re always forced to live in the moment when you’re on the road. You have to roll with the punches, which is hard to come by in day-to-day life—to say, ‘I’m here fully in this moment.’ That’s what’s missing when you’re back home. But you settled down in Los Angeles and wrote Floating Features. Shana Cleveland: This album is so much a Los Angeles album. It was written when for the first time in a while we weren’t touring that much. We had just moved here and we were trying to figure out our lives. It had been a while since our last album, Weirdo Shrine, had come out. It really feels like it’s drawn a lot from the landscape of Los Angeles. What I like about L.A. and what I find so inspiring is that it’s a city but it has so much space. You can go up a hill and get a view of the expansiveness of the city and the experience always has two stages. First you’re like, ‘Oh my God, look at this huge space with all these people and cars and sidewalks and it’s awe-inspiring,’ and then you’re like, ‘Oh my God, look at all that smog—am I breathing that?’ So it’s beautiful and then you notice the ugliness of it immediately. I find it to be surreal. The smog creates this filthy mirage. Everything is obscured but you know there’s so much out there. When I listen to the album it gives me the same feeling of like being at the Getty and looking out and being full of all this wonder and also disgust. I get that. The songs might be mellow and you can feel the ocean-iness, but then they’re full of monsters. Shana Cleveland: Totally. L.A. also has so much space to let your mind wander. I feel like in New York, or in Chicago where I used to live, there’s so much that’s inspiring but there’s also no way to escape it. I wrote a lot of poetry in Chicago because I could write it on the bus or in line at the grocery store, but I never wrote songs. There was never that space where I could have these ideas and inspiration but let them breathe and mutate into something else—into a song. It’s not enclosed here. There’s so many great parks and there’s the ocean and so many pockets that you can escape to. That’s to me what makes it unique as a city. So it seems like talking about being a woman is a touchy subject. I hadn’t planned to go there but you made a few comments about it and now I want to know what’s bugging you. Shana Cleveland: They try to act like it doesn’t matter but by mentioning it, you’re kind of saying it does. It’s a weird topic because you want to think we’re past that point. Will we ever get past it? Shana Cleveland: Probably not during our lifetime but hopefully one day. Maybe when we’re all robots, or when we’re all hive-mind and gender doesn’t exist because we’re just digital beings. Probably not too soon. We’re making progress. It feels like in the last few years there is a lot more open discussion, so maybe I shouldn’t be so pessimistic. It’s tough because we obviously don’t mind people noticing that we’re women. But it’s weird when we get these back-handed compliments. Like when someone tells Marian that she’s the best female drummer they’ve seen in a while. With our group of friends and people we associate with, it’s never a thing. The guys never say things like that. But when you go on the road you realize how people out there are behind the times. I had another question about the album—couldn’t really find any info about where you recorded. Shana Cleveland: We recorded the album in Nashville at a studio with Dan Auerbach but we don’t want that narrative to take over the album. I know it seems like we would want to use that to get exposure. But we thought about it, and as a band of all women, when there’s a guy involved, especially when it’s sort of a famous guy, that can tend to take over the narrative, and we wanted to keep the focus on the work that we did, so it’s not shifted to ‘Oh look what this guy did for this band’ instead of ‘Look what we did for ourselves.’ It’s the first album where we didn’t just play with our live setup. We stretched out a lot more and tried out different instruments and did a bunch of overdubs. For example: instead of Alice just playing her organ, she got to play a Hammond B3 and all these different synths that we wouldn’t normally have access to. We used a Leslie speaker on the organs all over the record, and on my vocals for ‘Walking Into The Sun,’ and just got to try out a lot of things to fine-tune the sound we wanted. How much time did you spend on recording? Shana Cleveland: We came in super prepared. We spent a lot of time in L.A. working on the songs, making demos ourselves and formulating ideas of overdubs so when we went into the studio we were able to get right to it. We spent a week tracking and a week mixing so in two weeks it was done. We were excited about working with a producer, especially Dan, but we have never wanted to work with anyone who would take over and form their own sound out of our songs. We’ve always had a clear idea of where we wanted to go. Where did you want to go on this record? Shana Cleveland: Our main vision was to branch out in the studio in ways that we couldn’t necessarily pull off live. Though now that we are getting ready for tour, we are trying to incorporate some of the elements we created with overdubs. But the idea is that when you’re listening to a recording it can be a different experience from the live show. There’s a certain energy in a room that’s exchanged between us performing and the audience, it’s a cyclical thing that doesn’t exist when it’s just a person listening on headphones, so we wanted to flesh things out and add things to the songs that would bring a different energy and experience for the one-on-one listener. Lena calls them ‘tasties,’ the little things you hear in your headphones. They don’t need to be there live but they make the headphone listening experience more cinematic. You’ve played together so much—do you feel that your bandmates’ styles have penetrated the way you write songs? Shana Cleveland: Definitely. I had an idea of what the band would be before the band existed, and that changed over time, having been together for five years. I always start the songs alone. I try to get out of the city and head out in the country to get in my headspace and work on lyrics and demos. Then I bring them to the band and we throw around ideas, then everyone writes their own parts. But when I’m writing songs, I can tell, ‘Yes, this is a La Luz song.’ When I’m thinking of writing a song us, I have an idea of who we are as a band, how our styles interplay, how our voices harmonize together. Harmonizing is such a great mystery. I get it conceptually but whenever it happens to me it feels like a lucky accident. Shana Cleveland: It’s like that scene from Spinal Tap where they’re all at Elvis’s grave and they’re singing ‘Heartbreak Hotel’ and they’re trying out harmonies and sound ridiculous. I think we still have that moment half the time we try to write harmonies. It’s like, ‘We’re doing the Spinal Tap thing right now,’ and we just start laughing. I’m lucky to have the girls. I might bring a harmony idea and they’ll be like, ‘No, that harmony doesn’t make any sense.’ Especially Lena and Alice—well, everybody in my band is more schooled than I am. Like I often won’t know what key I’m playing and they’ll just figure it out and work out any chords or notes that fit. So yeah that happens with harmonies a lot. It’s a lot of trial and error and figuring it out together. But when you become one voice, it’s just amazing! Yes! Vocal harmonies are so cool. They feel like magic every time. Does a certain era inform your approach to harmonies? For most elements of this band I look towards the 1960s. Not even just in America. A lot of my favorite harmonies come from Indonesian groups in the 60s. Definitely bands like The Everly Brothers, country bands, soul bands, early rock and roll bands. It just feels like for whatever reason that was the golden era for vocal harmonies that I just keep hoping will come back. When you can access everything, it’s hard to speculate on what will come back. It’s exciting though. We have access to all music so it’s unknowable what direction music will go, or what will get left behind. 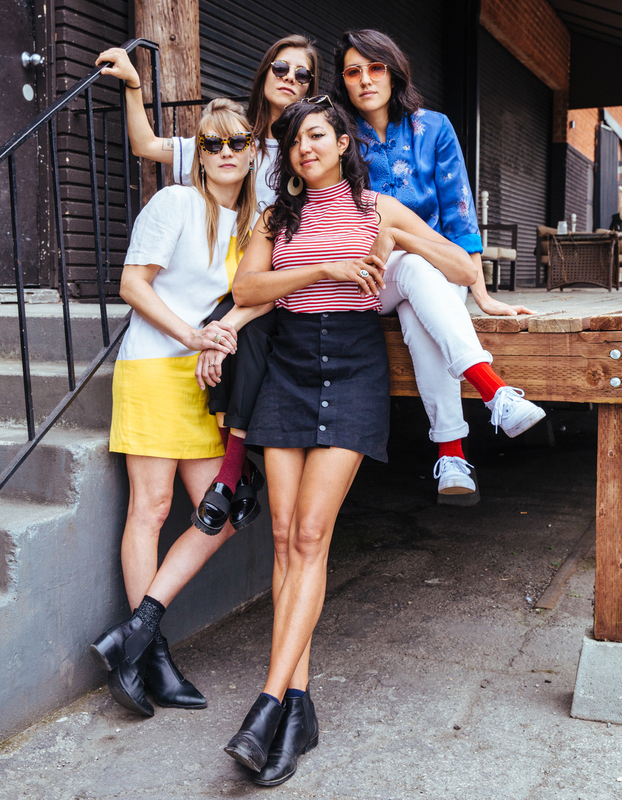 LA LUZ WITH SUMMER TWINS ON FRI., JUNE 22, AT THE TERAGRAM BALLROOM, 1234 W. 7TH ST., DOWNTOWN. 7 PM / $15 / ALL AGES. GET TICKETS HERE! LA LUZ’S FLOATING FEATURES IS OUT NOW ON HARDLY ART. VISIT LA LUZ AT LALUZ.BANDCAMP.COM.